See a helmet that needs to be updated or have photos of historical helmets to provide? Read over this page to make sure you know what we are seeking first in order to help us update a helmet here on the Florida HS Helmet Project. The first helmet to the left with the blue plus means we either have enough information to complete the helmet and have not done so or it is in production to be completed. 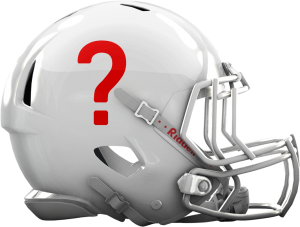 The second helmet with the question mark means we don’t have enough information to complete the helmet. 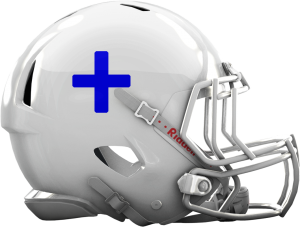 Most of time seeing a helmet like this will mean that a helmet decal is usually needed to complete the helmet. There is a combination of two things that we need in order to make a helmet update happen. Clear, close up color photographs of the helmet design. We would prefer to see both side of the helmet and front. This will tell us how the decals are positioned, the color of the helmet shell, color of the facemask and show us how the stripes look if any used. If the helmet is just a simple color for a shell and mask, photographs alone will suffice. **Please Note: Some of the simpler logos can be easily reproduce, but intricate logos, especially those custom designed for a school will require an actual copy of the decal itself. If a decal being used is that one of a college or professional team, please let us know which team it comes from. We can access these decals on fairly easy basis.